We have team 'All You Need is Luft' as undefeated leaders going into the seventh round of the League. They play team 'Poisoned Spud Variation' this round, who are breathing down their neck in second place. LoneWolf Season 11 has commenced, you can register for it here. We also have the results of the LoneWolf Season 10 survey here. Glad to see that everyone had a very good experience participating in the same, and we would like to thank all the LoneWolf mods for working hard to make it so. Except when they're sleeping, which is always. We also have a user contribution from @skmjonas, a graph showing the number of active LoneWolf players, each quarter since its inception. The inaugural chess960 tournament is wrapping up; registrations for Season 2 are open, and games start on June 11. Join the #chess960 channel on slack to know more. Register for Season 2 here. Season 2 time control is 15+10. Series registration is now closed, #3 starts on June 11. For more info on #3, https://docs.google.com/spreadsheets/d/1Nq2vJ6Fgs_o9xkhCLo85TBHO1MjcFDeVuV8FG16zQMs/edit#gid=1963619161. Update by @MasterSalomon, Season 3 starts on Monday (11 June). This week is playoffs week. Played between @alex_slow @eie24 @badplayer_cm @kobol @nytik @erinyu. Winner will qualify to Masters. Draw will promote player with black pieces. Loser will play in Candidate Master. 1. Only one group 'Candidate Masters'. 2. Groups 'Candidate Masters' and 'Group C' are shortened to 8 players. 3. Three players from Masters will be delegated to CM. 4. Three players from CM will be promoted to M.
5. Two players from CM will be delegated to Group C.
6. Two players from Group C will be promoted to M.
Annotated games from Chess960. To view all chapters please open the Study. A video by @quirked, covering a live commentary of Season 12 games along with @somethingpretentious. The fastest mate was white on move 15 found in Gamelink White: scrubthatdish, Black: michionov. 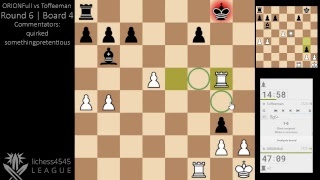 The fastest draw was on move 24 found in Gamelink White: pedropablo72, Black: spiteknight. The fastest resign was black on move 13 found in Gamelink White: seb32, Black: namulin. The biggest upset was 156 points in Gamelink White: fischyvishy, Black: lelouch_vi_brittania. The longest game ended with black on move 80 Gamelink White: flokithecat, Black: supermaths. 116 was the highest ACPL in Gamelink White: fischyvishy, Black: lelouch_vi_brittania. 9 was the lowest ACPL in Gamelink White: sebastianjl, Black: chaozu. Combined maximum ACPL was 190 in Gamelink White: danielshaulov, Black: akselm. Combined minimum ACPL was 24 in Gamelink White: niking, Black: notfoxanonymous. The longest think was 22 minutes 19.0 seconds by 12 in Gamelink White: bufferunderrun, Black: misiek91z. The most time left was 66 minutes 31.0 seconds in Gamelink White: pageprotector, Black: xvaria. The most time spent was 96 minutes 6.0 seconds in Gamelink White: kjfoster17, Black: wpruitt14. The fastest mate was white on move 13 found in Gamelink White: jughandle10, Black: dmavro. The fastest draw wason move 12 found in Gamelink White: loukas435, Black: mn8. The fastest resign was black on move 12 found in Gamelink White: dose7781, Black: tnan123. The biggest upset was 362 points in Gamelink White: maurice95, Black: tomek188. The longest game ended with black on move 64 Gamelink White: tomek188, Black: maurice95. 155 was the highest ACPL in Gamelink White: tnan123, Black: dose7781. 9 was the lowest ACPL in Gamelink White: loukas435, Black: mn8. Combined maximum ACPL was 280 in Gamelink White: tnan123, Black: dose7781. Combined minimum ACPL was 18 in Gamelink White: loukas435, Black: mn8. The longest think was 5 minutes 14.0 seconds by 12 in Gamelink White: erinyu, Black: journey_to_nm. The most time left was 19 minutes 8.0 seconds in Gamelink White: the_loving_boy, Black: forhavu. The most time spent was 24 minutes 4.0 seconds in Gamelink White: scrooge, Black: assassin_in_white.